There are many things afoot as this year begins and I'd love to share them all with you! I’m very excited to be heading out on a solo tour in the UK with special guest Sam Amidon. If you don’t know his music, check it out ASAP! He’s one of my long-time faves. We will be playing some songs together. Good times! I’ll be bringing my 9 year old son Tennessee to Colorado to show him the Garden of the Gods and other home-state treasures. He is my youngest roadie to date! My picture book about Elizabeth Cotten, “Libba,” just won the Pacific Northwest Book Award! It’s awesome to see the book making waves a year after publication and to know that more and more people are finding out about this wonderful hero of mine. You can buy a copy HERE at our website, or at your local bookstore or at - GASP! - amazon.com. Don’t you need a new bag to help you carry all the heavy records you are buying all the time at all the record stores? (Ha ha ha!) You can get one at any of my upcoming shows. If we have any left after these dates we'll make them available in our shop! 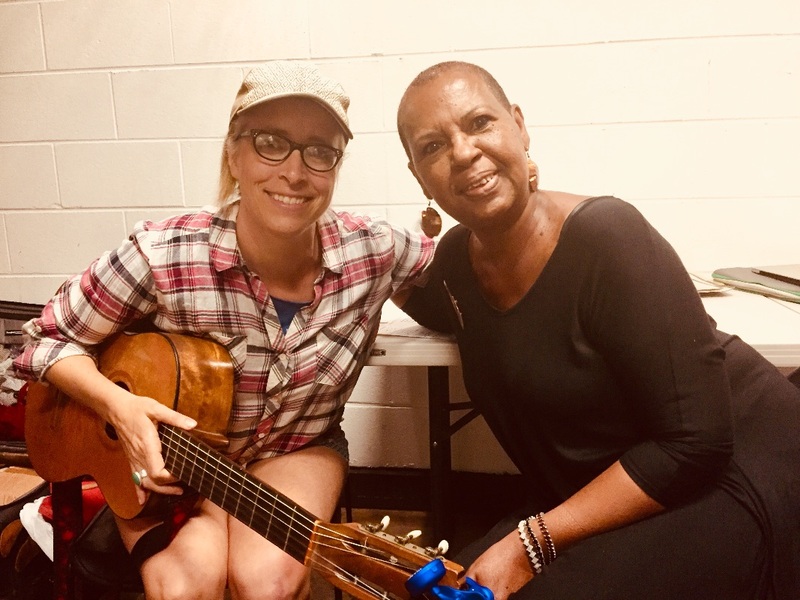 For those of you who have made it this far… Here is an essay I wrote about the process of making “Libba.” Pictured at the bottom is a photo of Libba’s great-granddaughter Brenda Evans and me backstage in DC last Spring. I’d been reading picture books to my kids for years before writing my own. I’d always taken pleasure in them but never really considered what a deep art form the genre is. It took creating “Libba" to figure that out. I didn’t know enough about African American history or current Black experience so I read about 20 books on those topics. I listened to tons of country blues music. I talked with several people who knew Libba and they gave me excellent information about her life but I wasn’t able to locate any of Libba’s family or inner circle during my first round of interviews so I gave up. Two years later, with the deadline for publication looming, I resolved to find someone. I made an exhaustive family tree from online articles and finally (through several tries on Facebook) found someone in Libba’s family who would grant me an interview: her great-granddaughter Brenda Evans. Brenda was raised by Libba in a house of 10 in Washington, D.C in the 50s and 60s. Libba would put Brenda and the other grandkids to sleep by playing them songs on her guitar. Brenda sang beautifully when she was 12 on Libba’s song “Shake Sugaree." Brenda helped me considerably with getting the details and tone right for the book. Over several long phone calls we became friends. When I played a concert in Washington D.C. last Spring Brenda joined me on stage and we sang “Shake Sugaree” together. This was one of many wonderful surprises that came about from writing this book. Next, let’s consider the pictures. When the illustrations capture the imagination and draw the reader into the world of the story they make the book. If done badly they can break the book. I had very little say over who the illustrator would be (this is typical in picture book publishing). I hadn’t heard of Tatyana Fazlalizadeh but when I saw her work online I loved it and had a feeling she would do the story justice. I couldn’t be happier with how Tatyana captured Libba’s gentle but powerful essence. Tatyana's work is remarkable especially because this was her picture book debut. From the first seed of an idea to publication “Libba” took seven years to come to life. (The book takes seven minutes to read.) This book was a labor of love that I’m grateful for because I read picture books with a new eye now. Some of my childhood favorites - “George and Martha”, “Little Fur Family”, “The Amazing Bone” and “Where the Wild Things Are” - strike me now as works of genius on par with any other art form. I can’t believe you made it to the end! As always, thank you for everything. I couldn’t keep doing this stuff without y’all. On the day after Thanksgiving I reflect on my gratitude for a wonderful year. My friends and family are healthy and happy (despite our country being run by monsters) and we have music, art, literature and nature to soothe our souls. This was a productive year for me on many levels and I’m grateful to all the fans, managers, editors, family members, collaborators and friends who have helped support my endeavors. NEW ALBUM - My new album “The Lookout” received great reviews and many of you came out and supported our Spring and Fall tours in the US and Europe. Thanks for the love! You can buy the album HERE. NEW BOOK - My historical biography picture book about Elizabeth Cotten came out as well. It received several starred reviews, a Parent’s Choice Award and was short-listed for the Pacific Northwest Book Award. It’s called “Libba” and you can buy it HERE. NEW PODCAST - I also launched a podcast called Midnight Lightning about the lives of musician parents. Though I’ve put the podcast on hold for the time being I learned an immense amount from doing interviews with 15 awesome women. You can listen to it HERE. NEW STUDIO - My husband Tucker and I purchased a building near our home for a new recording studio - our “forever studio” (hopefully!) It used to be a motorcycle gang hangout - if only those walls could talk! The build-out of the studio has been a huge and expensive undertaking but it is nearing completion. I look forward to making albums there and to hearing all the other incredible music to come out of there in the near future. Go Tucker and all the folks who are bringing this thing to life! MORE US SPRING DATES SOON! A lyric video for my new single “Watch Fire” featuring Sufjan Stevens premiers today at Pitchfork! Preorder my new album at lauraveirs.com and receive an instant download of the song. The lyric video is by Lauren Stelling; the handwriting is by Spanish artist Izar Etxeberria, with the "Lookout" eye provided by Anisa Makhoul. Also, FYI Sufjan is playing at the Oscars next week! Congrats to him! It was an honor to have Sufjan sing on this track as I admire him a lot. I heard his voice on this song when I wrote it. We’ve been friends for a long time and he’s given me quite a few artistic pep talks over the years. I sang on his Carrie and Lowell sessions so it’s nice to have him on my record this time around. Also, some more tour dates up at lauraveirs.com - new ones with my buddy M. Ward! Hope to see you soon... Thanks for sharing the word about this new album and tour! My 10th album is done and dusted! I wrote songs every day for over a year to get this batch. My longtime producer (and husband) Tucker Martine recorded and produced it last Summer. Many dear friends played on it including special guests Sufjan Stevens and Jim James. It’s a concept album about the fragility of precious things. It’s about the importance of looking out for each other. I’m proud of this one and hope you enjoy it! Thanks to all involved! Street date: April 13th, 2018 | Pre-order album: HERE NOW! First 100 pre-ordered CDS and vinyl will arrive SIGNED BY ME before street date. All pre-orders will include a download of the 1st single. First single/video: "Everybody Needs You” - watch HERE NOW! US, UK & European Full Band Tour! See dates below! This music is coming out in N. America on my (literal) Mom-and-Pop label Raven Marching Band. Bella Union is our partner overseas. It keeps us afloat when you share the news with friends, buy albums, buy tickets to shows or all of the above! THANK YOU FOR YOUR ONGOING SUPPORT! I’m grateful I get to make music for a living. I’m excited to announce that my first picture book is in stores today in the US, Canada and the UK! It’s about one of my guitar heroines, Elizabeth Cotten. It was beautifully illustrated by NYC artist Tatyana Fazlalizadeh and is being published by Chronicle Books. Thanks to everyone who made this book a reality. It was a years-long process and I learned a LOT! You can also buy the book online at amazon.com, indiebound.org, barnesandnobel.com or chroniclebooks.com.